Patrick Joseph Whelahan is a graduate of our BSc (Honours) in Digital Technology Design and Innovation programme. What did you get out of the course, what did you learn? Coming into the course,I had more of a computer science educational background, where the focus was more around technology. Soon after commencing the course, I found myself focusing on the end user a lot more. Getting to know what problems users were having and how to marry the user-centred approach with the technology-centred approach, to come up with solutions to real problems. The course really opened my eyes to designing around the end user’s needs, empathising with them and getting continues feedback from users throughout the design process. From a skills point of view, I was relatively up-to-date with how fast technology changes, but the course helped me focus on the core skills and tech that I needed to fit into a company like IBM Design, which designs enterprise software on a global scale. 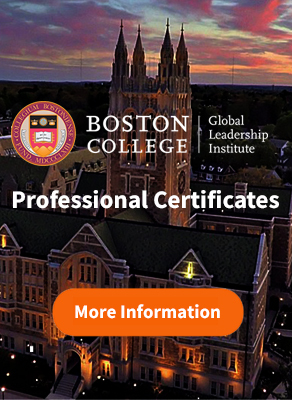 What are the pros and cons of taking the course online? The course helped me learn how to communicate with multicultural and multidisciplinary teams working in virtual environments. Here at IBM Design we continually work on teams that are geographically-dispersed around the globe and are made up of multiple disciplines, so I have been able to bring in what I have learned from the courseand that has really helped me to adapt well to that type of working environment. One disadvantage of working with a virtual team would be real-time communication. When you have deadlines to meet, and you need feedback or need to communicate a concern you may have with your team about a project deliverable, having to wait for people to be online can be difficult. We experience the same difficulties here at IBM Design. What it does though is it makes you and your team more productive when you are all together, helps you cut out the noise and concentrate on what’s important. What were the advantages of working with on an entrepreneurial project? I worked on an entrepreneurial project and what I liked about the process was the entrepreneur was passionate about the project from the start. I am a very passionate and focused designer, and when I work on a project I treat that project like it’s my own. Having an entrepreneur whom is as passionate and enthusiastic helps create a great dynamic and energised working environment. What skills did you learn from working with on the entrepreneurial project? Working on an entrepreneurial project helped me learn how to communicate effectively with all stakeholders involved with the project. Communicating your ideas, your points of view, to a team can be difficult, but working on the project helped me develop my listening skills, become more assertive and better able to communicate ideas in an easily digestible way to the team. It also helped me keep the user needs and business need aligned. As designers, we can often get too focused on designing great solution to user problems, and forget we also have to design great solution that also fulfil the business needs. The course helped me combine the design and business needs together. What benefits did you get out of working in a cross-functional team? As I previously mentioned, working in cross-functional and multidisciplinary teams helped open my eyes to the problems faced by the different disciplines. When a project kicks off we all feel our part of the project is the most important. 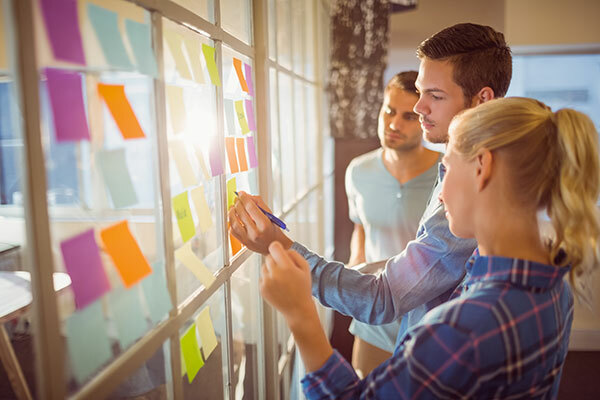 When you work within a team with designers, developers, project managers and marketers, all the challenges we all face throughout the project can be easily communicated and surfaced allowing the team to work together to overcome them. I face the very same challenges in my current role, so having gained the experience form the course has really helped me. What type of project did you develop when on the course? We developed a small web App that allowed employers connect with people looking to work closer to home and people to connect with employers to let them know they are looking for a job in their geographical area. The unique selling point was to cut out recruiters and let the two parties connect with each other directly. What was your course speciality? My speciality was digital design. After graduating from the course, I successfully gained a role as an enterprise software designer for IBM Design. 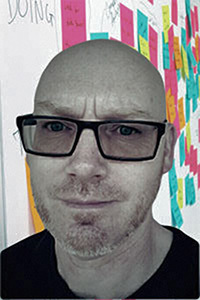 I currently work at the IBM Design Studios in Dublin as a user experience designer and researcher. What were your goals when you started the course and did you achieve them? My only goal was to start a career as a digital designer. I was really that focused. I decided to make a career change, I wanted to start a new career in something I loved doing, something I was passionate about. It’s an old saying, but find something you love to do and make a career out of it, really resonated with me, and that’s is exactly what I did. Was it easy? No. As an individual and a family unit there were a lot of sacrifices to be made, many long nights, early mornings and missing out on family activities, but when you want something enough you will always see light at the end of the tunnel. What are you doing now and how did Digital Skills help you to get there? During the course I became aware of IBM opening their Design Studio. They were shifting the way they worked by using Design Thinking. The old way is that you come up with a new product idea and then try to sell it to customers. In the design thinking way, the idea is to identify users’ needs as a starting point. I really liked that and from what I had learned on the course about designing for your users I could identify with their way of thinking. My current role, as a user experience designer and researcher with IBM Design, allows me to put design thinking into practice every day. When you are designing software products on a global scale, the costs of not solving real user problems can be enormous. With IBM design thinking, we put the user at every stage of the design process, which allows us to solve those real user problems. Anything you'd have done differently? I don’t think so. I I gave it my all, worked hard as an individual and as a team member, asked for help if I needed it, helped others if I could and kept a very positive attitude throughout the course no matter what challenges life threw in the way. Any advice for future participants on the programme? Just some advice for anyone thinking of doing the course or anyone already doing it, don’t wait for things to happen, make them happen for you. You have got to use your own initiative. Make goals at the start of the course and keep those in mind throughout. If you have an employer in mind you wish to work for, don’t wait until the course is over before you connect with them. Research the company, their culture and let them know you exist, what you are doing and where you want to be. And don’t accept rejection, keeping chasing them, try to get talking to them face to face and show them how much you want to work for them, show your passion and your ambition.